I’m a huge dog-lover and a sucker for any story featuring man’s best friend. 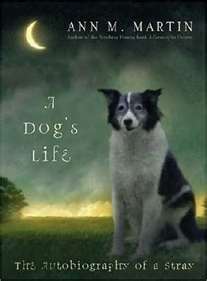 Buck, Lad, Kitty, Marley, Lassie, I’ve read them all. Add to that list Squirrel, a loveable stray who tells her story in the first person. Born in a deserted shed, Squirrel was content to live and play with brother, Bone, and an assortment of mice and feral cats that shared their quarters. But one day Mama doesn’t return, and Squirrel and Bone are on their own. Squirrel meets a variety of characters, some good, some terrible, and as she shares her story, she wins your heart. Clean, sweet, adventurous and not over-sappy, A Dog’s Life is an great choice for animal lovers age 9+ and a great read aloud for younger ones. As an added bonus, Squirrel defies that singular complaint I have with such stories and happily lives all the way to the end of the book. Recommended for ages 9+.